1 spool of 30 guage alluminum wire from Radioshack, comes in red, blue and white in 50ft. Do not get the magnet wire that is copper. The copper is very stiff while wrapping also the enamel insulator easily scrapes off causing minute shortages. 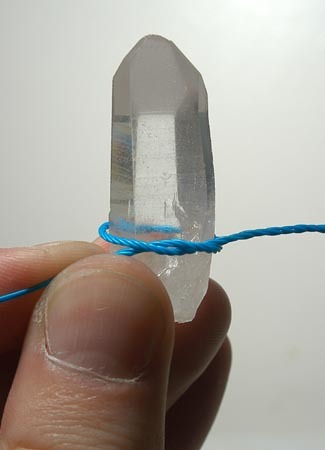 First select a length of wire that will be appropreate for the size of crystal. 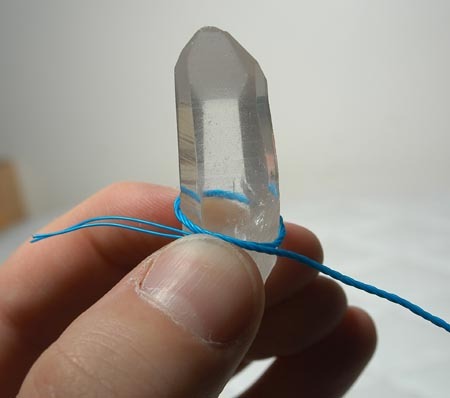 Very small crystals will need only three feet of wire, larger ones with a diameter of 1 inch or larger will need 20-25 feet or more, the hole spool for giant crystals. 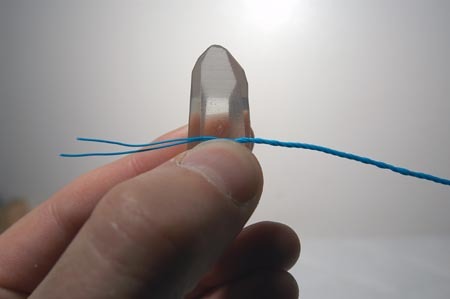 Fold the wire in half, then fold that in half again. Basically folding the wire into quarters. Now take the end where both ends are bent, place them into the locking chuck of your cordless drill. The easiest way to keep them together evenly in the drill is by starting a small twist to hold them together. 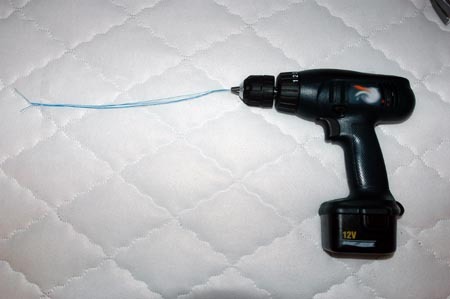 Set the drill direction so that it will remove a screw. 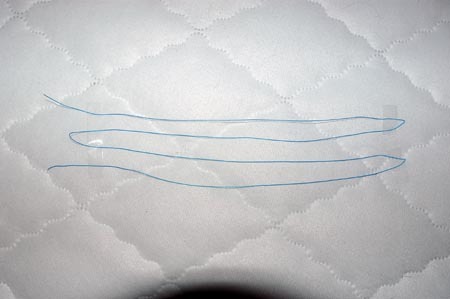 (lefty loosie) With your other hand, hold onto the end with the two leads. 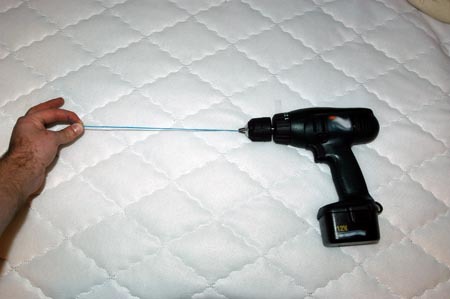 Make sure you keep good tension while the drill is rotating. This will minumize irregularities. If the wire is longer than your arm span have someone help hold it or clamp it to a sturdy stand. 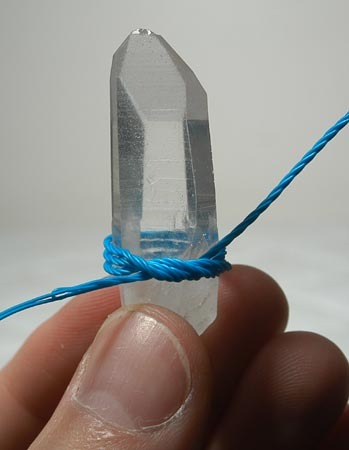 You'll know the wire is correctly wound when the thread angles are at 45 degrees. 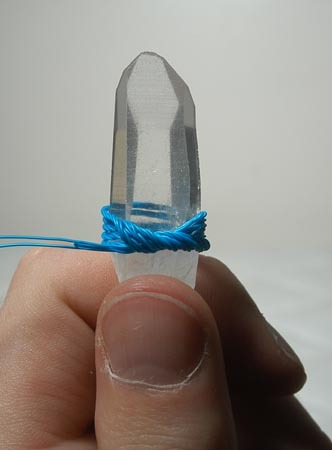 Hold your crystal and wire like so. You will be doing a counter clock wire wrap that works upward. 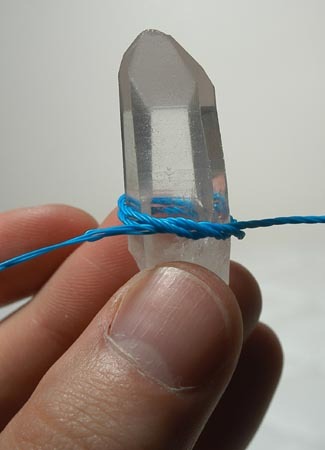 Here is how you start your first knot. Notice that the knot goes over, down, up-around. It's basically a square knot. 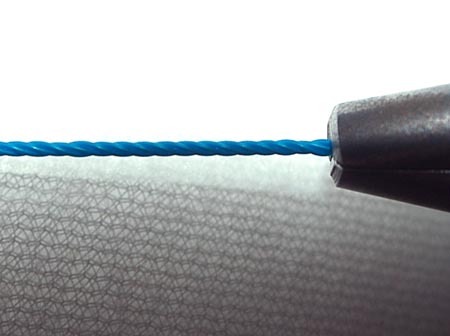 Keep this knot a little loose because you'll need the space for the remaining knots. Now repeat the process. You'll notice the wire working upward. While the knot keeps getting larger. Start pulling the wire tight. Here is how it looks going around a third time. Each time you start a new knot you start just before the last one. Remember to keep the wraps tight. This will ensure you don't have any wires overlapping on the back. If you notice the knots getting to difficult to overlap then start another row the sameway as the first. Pull the excess just a little above the first mobius wrap, wrap the wire around CCW then do the knot and keep repeating as many times as needed. It's basically a simpe pattern that keeps repeating.